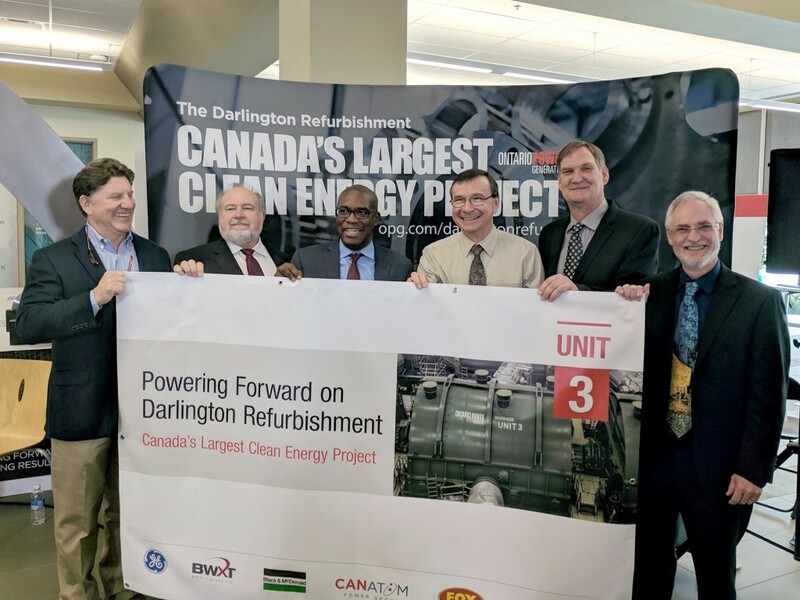 On February 15, 2018, OPG announced it has reached the halfway point of the refurbishment of Darlingtons Unit 2 reactor on time and on budget. With that announcement the Ontario government confirmed its commitment to begin work on the next phase of the project, the Darlington Unit 3 refurbishment. This is excellent news for the nearly 1,000 Society members who work at and support Darlington NGS. The refurbishment process will see continued operation of the station up to 2055. Unit 2 is the first of Darlingtons four reactors to undergo refurbishment and is scheduled to be completed by 2020. The ongoing success of the Darlington refurbishment has important ramifications for Society members, with 10 units scheduled to be refurbished across the province between now and 2033  four units at Darlington and six at Bruce NGS. The Unit 2 refurbishment shows that these projects can be delivered on time and on budget. Between the refurbishments and the ongoing operation of the plant, Darlington will contribute $90 billion to the Ontario economy through its life cycle and boost employment nearly 15,000 jobs per year. It also produces nearly one-fifth of Ontarios electricity emission-free. Soctt Travers, The Society of United Professionals President, is proud of our members work on the refurbishments and the unions work to secure the investments needed to undertake this work.